The Bible is explicit: We live in a world of distinct opponents; our very lives are a battle. Yet too many Christians lose more battles than they win and endure their walk with God rather than enjoy it because they don't recognize the enemy when they see it. More importantly, they have no idea how to respond. While society tells us we can react simply, the truth is that a wish, a hope, and a prayer are not the best responses to attacks from those who stand between us and the Father. Christians must be strategic in their reactions to these clearly defined enemies, learning how to fight biblically and effectively rather than just sincerely. In Spiritual Warfare, Dr. Karl Payne - pastor of Leadership Development and Discipleship at Antioch Bible Church and Chaplain for the NFL's Seattle Seahawks - has written a guidebook for defense that is simple, biblical, and transferable. Through his teaching on how to recognize and resolve attacks from the world, we learn that we are more than conquerors in Christ. This book was full of examples and practical advice on a difficult and easily misunderstood subject. I truly appreciated this book. Appreciate sharing of real life experiences then summarizing both successes and challenges based on biblical principles. Simple yet effective strategies outlined with scriptural references. The evil one is hidden in the darkness and has many disguise’s that we don’t always recognize. Please open your mind to understand the spiritual battle that is going on. This book gives a clear understanding and many life examples to learn from. Great read! Very interesting and informative. 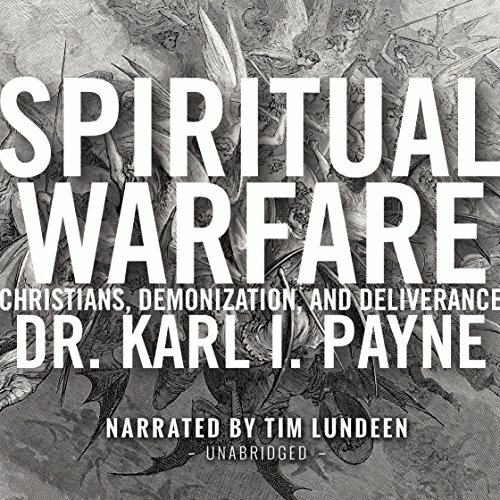 Helpful explanation around spiritual warfare. Applicable for lay people and spiritual leaders. Narrator did a good job.